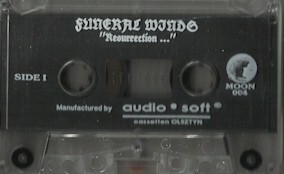 Funeral Winds was founded in 1991.The first official recording was released as "Rehearsal/Demo '92". Only a few copies were send to underground magazines and bands, the tape was never for sale. In 1993 the second demo was released, called "La Majeste Infernale"(The Infernal Majesty), and spread the name of Funeral Winds within the Black Metal underground. The same year again new recordings were made, two studio and two live tracks, and released as the "Resurrection..." demo, released by Pagan Records from Poland in early '94. An illegal bootleg album containing the "Resurrection..." demo as well as on the B-side demo recordings of Demonic from Norway was released later. It is unknown how many copies were pressed of this LP, and who released it. In 1994 Funeral Winds was invited to Poland to headline, together with the Polish bands Kat and Vader, on a festival called "Sthrashydto '94". A video entitled "Live in Poland" was recorded there. Right after the festival Funeral Winds entered the studio to record six tracks, two for the release of a 7"ep released by Black Arts and four for a Split CD with Abigail (Japan) on Warmaster Records. After these releases the band got signed with Lethal Records for two albums of which the first one should have been released in the summer of 1995. Right after the recordings, guitarist/songwriter and only remaining founder of Funeral Winds, Hellchrist Xul got arrested for a manslaughter attempt which troubled his work for the band and together with Lethal Records bankruptcy it caused a delay of three years before the '95 album "Godslayer XUL" was released by Daimonion Records in 1998. Pro printed covers and pro pressed tapes. Released by Pagan Records from Poland.